Forgive him, Father, for Stephen Colbert has sinned. He knew it was wrong at the time. But he went ahead and did it anyway. Now he’s begging for forgiveness. Based on his popular segment from The Late Show, Stephen Colbert and his team of writers now reveal his most shameful secrets to millions (although, actually, he’d like you not to tell anyone). 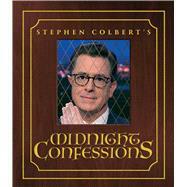 Midnight Confessions is an illustrated collection of Stephen Colbert at his most brilliant and irreverent.